Include anglerʼs name and what kind of fish. PHOSPHATE MINING Mosaic is now hinting at 2023 for submitting their zoning change request for a mine in DeSoto County. The thinking is, a slowing world market for phosphates means they wonʼt need ore from DeSoto County until then. But the April hearing date is still on the Desoto Zoning Commission schedule. The possibility of a phosphate mine on Horse Creek, just upriver from Charlotte Harbor, remains very real. CORRECTION – QWater LIFE, I just wanted to let you know that Mr. Hellerʼs article “chief says the Boat was Uninsured” erroneously stated that Officer Kohl shot and killed “ Jeanette Knowlton” librarian, 2 years ago. Mrs. Knowlton first name was Mary. just fyi. Janette Knowlton, County Attorney Ed notes* Sorry, Janette, Iʼm losing it! ...and I even misspelled your name!! still only $105 per month! The effective & economical month-long advertising solution! 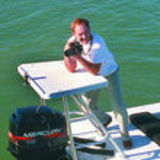 WE areTHE WAY to reach people who love the WATER! We checked around and found itʼs a Natica, Neverita didyma, a northern moon snail, also called a shark eye. They have a mucousy outer band. Naticarius Neverita didyma, the common name is the bladder moon snail or moon shell, is a species of predatory sea snail, a marine gastropod mollusk in the family Naticidae, the moon snails. RENEW AGAIN!! 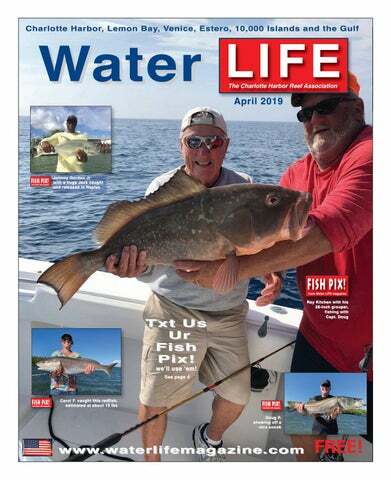 DOCK SAVERS: "WE ARE VERY HAPPY WITH THE RESPONSE TO OUR AD IN WATER LIFE"
Left: A 50-pound-plus grass crap, caught in Rotonda on 6-pound line. In the photo are Carter Shaffer, Clayton Shaffer and Aidan Flack. The fish was released alive, it was the second fish Carter ever caught! Above: Skyler Bushey with a catch and release gar at Port Charlotte. Both photos earned $25 FISH PIX vouchers, good at Fishinʼ Franks. you were laying around for a few months this past winter, not eating, you would now want something high in fat. Big snook didn’t get big by eating a low fat diet. The one food source I look at is mullet. Areas with a high concentration of mullet will have big snook. Another food source this time of year is crabs. I catch a lot of big fish that spit up crabs. The hard part is you don’t know where the crabs are. This takes years of fishing to figure out, and that knowledge can’t be bought! The best way to locate big hungry snook is to go fishing. Look for a food source and good moving water with some structure. You never know you, might just find yourself a honey hole. SHARKS: From Zero to 100 in one month! By Capt. John Brossard Water LIFE Sharking April is another of my favorite months of the year for sharks. We still had some cool water in March and with it some slow shark fishing, but March ended warmer and April is starting with a big bang. The water temperature was a little cool, around 72, but now another few degrees has made a whole lot of difference. Practically all sharks have started biting. From the little Atlantic sharp nose to the monster bull sharks, they are all taking line. In the area where I fish, South of Marco Island, so far anyway, the bigger sharks tend to be closer in to the estuaries. Right now they can be found in shallow waters and cruising around the near shore flats. When you are shark fishing, watch out for those monster tarpon picking up your shark bait by mistake. That happens regularly in April. Keep a grip on your rod! The near shore reefs from one to 10 miles out are holding the one to four foot ‘eater’ sharks, animals such as the tasty Atlantic sharpnose, blacknose and blacktips.... which have been very acrobatic lately. By the way, I am going to give you a piece of knowledge that has taken me 15 years to learn: sharks bite 96-percent less on wire than plastic coated wire. Put two rods out and test my theory. I have been testing it lately and it is still very accurate. One of my customers brought fishing rods on the boat with coated wire and he out-fished me 7 to 1. Try it yourself. Happy Sharking. They are out there! Rochelle Nault catch and release big blacknose off Marco Island. Some of you may recall last September's event that closed the ICW in the City of Venice to boat traffic for a entire Saturday to conduct sculling races. Due to the Red Tide at the time, the impact on recreational boaters was minimal. The event only drew one out of town "krewe" and was considered a huge bust. We obtained over 1,000 emails from the city of Venice that showed the under handed methods used by the Sarasota Scullers to obtain their permitting. I think it borders on criminal. As an example, the "public" comment period was cut from 30 days to 15 days and notice was not publicized in such a manner that the everyday boater would find out about it. Our Freedom of Information Request to the USCG six months ago has gone unanswered. They claim to "have a date" (Sept.28, 2019) but at this time they have no permits. We believe that rules and procedures were not followed last year and "higher ups" railroaded this thru. MILLIONS of taxpayer dollars were spent on the rowing park up in Bendersonville off I-75. Apparently that's not good enough for them – they want the ICW too. "Fool me once, shame on you. Fool me twice shame on me." This year we are watching more closely. I fish almost every day for bass. I hooked at least 15 five pounders last year. You will see me with plenty of large bucket mouths as each week goes by. Here's a largemouth from Saturday and an evening one from last week. Nicholas J. from Ft. Myers. Art Alcock with a nice catch and release AJ. This is me! Cathy Price Just offshore 7 miles from Boca Grande . Red Drum! Caught 4 at the same time with mullet and deep lures. All four rods hit at once. Was crazy! Of course catch and release. Christian Sommer with a catch and released triple tail. Natalie Bordes caught this Jack Crevalle in Alligator Creek. Sheepshead while fishing for bait Rick Doll of Punta Gorda. Tom aka "The Paraflex Kid"with an decent 22-inch porgy, this kid can get the job done!!!! SW Florida Baby!!!! Grandpa Gordon took Carter and Lenox for a memorable day on the Peace River in March. These 2- to 4-pound topsail cats made for a great fish fry an hour later. Johnny Gordon Jr with a triple tail caught and eaten on the same day ! Super good eating Sarah-Marie with a huge smile on her face after catching a nice snook in her back yard. It was released after the picture. Abilene in the rain with a snook her mother caught and released in a Punta Gorda canal. Paige Balsinger, kingfFish caught 25 miles offshore, south of Venice Jetty. Lolo Harris caught this 32-inch red grouper in 114-feet of water. Russ's weekend! Hole in one yesterday, 34-inch snook today! John (woody) Wood of Venice sheepshead off Venice Inlet. Nicholas Magazzeni caught this trout in the Apollo Canal trolling with a DOA!! Alex B. from Ohio at Ponce Inlet. Snook on the last cast on a vacation filled with monster snook and her first red, a 28 inch tagged beauty on dead mullet. It was one of the fish tagged and released by CCA Florida; as part of their Red Tide Recovery Initiative. The fish will go on to spawn up to 2 million eggs. Call the Captain! Waterfront Pool Home! Fantastic curb appeal, tile roof, 2/2/1 with many updates. Bring your bay boat and lets go fishing! $199,000! Call the Captain! Deep Water Sailboat Waterfront with 105 Feet of Seawall! South facing, wide canal and short boatride out! Only $189,000! Who's your daddy? SW Florida Sizzle, Baby;)!!! This guy is putting some serious time in SW Florida, come and get you some. Hooked a lot of nice quality bass this weekend but this one gave me the best hit and action. This bucketmouth hit my frog like a gator! Theyʼre only going to get bigger as time goes on! Chris Dans of Punta Gorda with one of 7 snook taken on 7 consecutive casts the night of March 10. This one was 30 inches. of money by charging people to park at our beaches and boat ramps. The money collected at the Placida ramp is greater than the total amount collected from all the users at the Port Charlotte Beach Park. With the exception of Placida, the revenue from the other boat ramps is only $25,044 total, that is less than 5-percent of all the money collected. Now there is a big discrepancy between the county's figure for total boat ramp revenue of $166,690 and the figure I came up with of $61,465. That's more than $100K. Where did that money come from? I suspect it comes from annual parking passes the county sells for $50 plus a $3.50 fee That's right, you have to pay a fee on a fee. Last year the county generated $149,917 from these passes. To my knowledge there is no way to determine how much of that money came from people parking at boat ramps versus parking at the beach. In order to make the numbers work, the county would have to assume that 83-percent of the parking pass money came from boat ramp use; not likely in my opinion. Here is the biggest thing I learned. None of the money generated from the parking fees from both boat ramps and beaches is used to maintain the facilities that collected that money. It all goes into the County's general fund to be used anyCaptronb@juno.com way they see fit. parts, but what I am thinking about is the wrist. A woman’s wrist is different than a man's wrist. They move differently and while the bones are proportionate in size, a woman’s wrist is smaller than a man’s of the same height. So Penn has changed the gear ratio of the reel and the length and angle of the handle. They used a lighter weight rotor and painted it with pink accents and called it the Passion Reel. It comes as just a reel or on a combo rod. The rod is well balanced with the reel and has good guides that after years of use will still hold up. Every other so-called woman’s reel is just the same reel they sell men only painted nicer colors; not really what I would call a woman’s reel, just a prettier version of a man’s reel. Woman catch fish, use lures and or bait, and here in South west Florida there are couples where the women is the angler and the husband drives the boat or reads while she fishes. This is common place. Fathers often dream of having a boy so they can have someone to fish with. Well to be honest, when a little girl goes fishing with mom or dad they figure out quick if they hold the fishing pole they get to spend time with their parents and often are excellent anglers by the time they are 6 years old. While boys, when they are young, spend 3 minutes holding the rod, 5 minutes playing in the bait bucket and then see a crab or something and are off chasing what ever it was they just saw. With boys it is usually after they are 6 that they really start to figure out whether they are into fishing. Then, once hooked, they will be at it every chance they get. But to be truthful, it is the girls who when young will spend all day just fishing with Dad. This is not science or fact-based, just 35 years of me watching and listening to my customers.... who, by the way, are about 40-percent female. This is not an ad for the Penn Passion reel, this is an important moment in history that is being over looked. Shannon Johns with a single bass and then two on the same lure! Andrew Cahill, Trey Ashley, Randy Smith and Brett Smith on a veteran trip with Veteran Excursions. Trey Ashley on a trip with Veteran Excursions. Jan Seibert sea trout caught on Charlotte Hharbor Len Rizzo with his first lady fish. Red Fish Charlotte Harbor. Patrick Brasington Michael Cruz with a crevalle jack! Izzy Rogner - My first Kingfish! Russ CHAMARD took me fishing. My name is Keith Mullins from Ontario. We were out with kayaks out of Placida. We caught several snook and red fish, but this 42incher caught and released was a BEAUTIFUL snook. Russ caught the fish and released it and what impressed me was he never positioned the fish vertically the whole time so not to harm the organs - great fisherman and conservationist. The fish took Aprox 12-minutes to land and we estimated its weight at 22 to 25 pounds. We measured it at 42 inches. Skyler Bushey, catch and release snook, Port Charlotte Captain John Baines finding some early blackfin offshore of Boca Grande during the middle of March. GOOD FIND! FWC dispatch received a call from a girlfriend of a commercial fishing vessel operator. The reporting party told dispatch that her boyfriend had called her, saying that his fishing vessel was sinking, and they needed help. She was unable to give dispatch any vessel description and only was able to advise that he was heading towards the Marquesas Keys. Officers responded by vessel to search the area while their Lieutenant contacted the reporting party directly and gathered more information. Through coordinated efforts, officers found the two men in the water hanging on to a life raft with their vessel almost completely submerged. The two men were brought on board the patrol vessel and returned to Stock Island Lobster Company. SNEAKY SNAKE The Police Department had received several complaints about a man walking around the down town area, carrying a large rattlesnake. When a police officer arrived, he recognized the man with the snake as local homeless person. For everyoneʼs safety, the officer called the FWC and instructed the man to place the rattlesnake in its cage and put it in the back seat of his patrol car. When the FWC officers arrived, the man was no longer on scene and the officer advised them the rattlesnake was loose on the backseat of the patrol car. COMING Sportsmans Wholesale, a large format outdoor discount store, is supposedly coming to Charlotte County with a planned opening the first week of June. You can look at their North Carolina store in a video on their facebook page to get an idea of whatʼs what. road with animal traps on the vehicle roof. The traps contained water bowls and cracked corn. Officer Araujo saw two individuals exit the wood line and head towards the vehicle. Officer Araujo identified himself to the subjects who spontaneously stated that they had a license to trap bobcats. Traps contained cracked corn and water were placed on the ground to feed live chickens... used to attract bobcats. The following charges were filed with the State Attorneys Office; trapping out of season, not attending to traps within 24 hours, placing bait on a Wildlife Management Area, and attempt to take bobcat out of season. LOOK NO HANDS! Officer Winton and Lieutenant Spoede were on patrol at the mouth of the Caloosahatchee River when they saw a jet ski violating a posted slow speed zone. The officers conducted a vessel stop, at which time the operator exhibited signs of impairment. After performing poorly on field sobriety tasks, the operator was placed under arrest for boating under the influence. Once back at the marina, the operator, who was handcuffed, jumped off the officerʼs patrol vessel and attempted to swim away. Fortunately, the officers had previously ensured that the subjectʼs life jacket was secured properly and were able to reel him in. out the use of this term for weather messages in December 2018. In High Seas Forecasts, PAN PAN indicated there are winds of 64 knots or greater within at least one section of the forecast. Audio alarms for significant weather, such as 64 knot winds, will continue to be activated even though the term PAN PAN will no longer be used. The term SECURITE will be used as an indicator that important information, including instances of winds 64 knots or greater, will follow in the forecast section. The term "PAN-PAN" was used as a marine radio-communication protocol to indicate an urgent event aboard a vessel, when there is no immediate danger to life or the safety of the vessel itself. The FWC is requesting people to report horseshoe crab sightings. If you download the FWC REPORT app for your phone. The app sends your report and GPS location with it. the rainy season from the tree roots exposed on the upper bank. We continued following it to the wooden bridge then turned and headed to Arcadia for lunch. If the Mosaic Company were to pursue a phosphate mining operation here, Horse Creek would be rerouted and channeled and the surrounding land devastated. The mining process would use and pollute millions of gallons of water. Not a good idea. would look like filled with sailboats racing. To this day, one of the race courses goes as close to the bridge as possible. Visualize 30 boats trying to be first to the rounding mark closest to the bridge. But the race has a more powerful draw...the Conquistador Helmet that is entrusted to the winner of the “reverse start” race on the second day of the regatta. This distance race starts slowest boats first and the fastest boats have to pass all of them to finish first and get custody of the Helmet. This year there were 30 boats racing to get custody of the Helmet. There were three races scheduled for all six boat classes on Saturday in winds of 7- to 15- knots from the north east. Each class had their own start and were scheduled for three races. At the end of Conquistador Cup winner PathFinder (orange sail) scoots by day one the leaders were Fancy Free, stealing the wind from her sails. KAYAKING Unpredictable Weather at Boca Grande By Bob Fraser Water LIFE Paddlesports I had a charter at the end of March with two men who were visiting from Wisconsin and Michigan. We had rescheduled the trip from a Tuesday to the following Thursday because the weather report looked much better. My favorite place to fish is Gasparilla Sound, for several reasons. First of all, you don’t have to paddle very far to catch fish (my clients pay me to take them fishing, not paddling). Secondly, it’s easy to launch a kayak and you don’t have to compete with motor boats. When there is an east wind, I fish at Three Sisters, off of 19th. St. Hoagens Key can usually block the east wind. Being in a kayak we are limited to going to the lee side of an island. Hoagens Key is the only island close enough to paddle to. Boats can travel across Gasparilla Sound to Bird Key, Turtle Bay or other places to get out of the wind, but not so in a kayak. the launch it looked calm, but of course when you start paddling, it’s a different story. Today was no different. The winds felt more like 15- to 20-mph, but we stayed out for three hours and fished. We were all soaked from water coming over the kayaks. The last hour, we fished close to the shoreline of Peekins Ranch Cove to get out of the wind. On the way back to the launch site, it was a very rough paddle. When we came around a point we were facing right into the west wind and it was like hitting a wall. It was one of the hardest paddles I’ve ever had. The fishing wasn’t very good. There was a slack tide all day. I did manage to catch a Spanish mackerel on a Z-Man soft plastic, which surprised me. I usually catch Spanish on live shrimp or a silver spoon. I also caught a trout on live shrimp under a popping cork. With the slack tide and strong wind it was a tough day. ament line as your main line, you can do that. Between my main line and wire line, I use a barrel swivel. For my wire line, I use 20inches of AFW 7x7 40-pound test Surflon Micro Supreme Knottable, nylon coated stainless steel leader, color camo, Model number DM49-40-A. Wire line is necessary due to the sharks sharp teeth. There are many other wire lines you can get, not just this one. Some wire lines come already attached with the egg sinker weight on them. When attaching the hook to the wire line, use circle hooks. The hook size I use for the cut ladyfish is a 5/0 size hook. Note: before you go fishing for shark, make sure you check all the fishing regulations (rules) for the area that you fish at. There are certain shark you can catch (land) and other types of shark that are prohibited that have to remain in the water at all times from shore or vessel (boat). The fishing regulations (rules) may change in the future and you may also need a permit to catch these shark, along with using non-offset non stainless steel circle hooks. So, good luck and happy fishing! Fish with one of our Guides Youʼll learn something and youʼll catch more fish! chum for yellowtail, the oil makes the noodles sink. Go easy! Redfish are doing pretty good. In the bays and on the east side, the reds seem to be looking for the shade now. Heavy branches over deeper water and a piece of whitebait are the recipe for redfish. Trout should be moving in this month. I think the best trout will come in May and June, better than November and December... that’s my forecast, let’s see if it holds up. Fishin’s been pretty good. Guys are having success with a lot of different fish. Spanish are in close and in passes. King mackerel are closer in too. Bait has flooded in and they are after it and coming into Boca Grande Pass now. The other fish guys go to the Gulf for are snapper. Mangs, lane, yellowtail and vermillion are all to be had along with porgys and grunts too. AJ and reef fish are thriving at the Boxcars and Bayronto. Lots of barracuda too.The guys say ‘cuda got thick all of a sudden. Inshore, pompano have been in the Harbor and on the beach, along with whiting. Black drum are still here and a few sheepshead are still around too. Snook, trout and redfish are thriving. Red tide might have reduced their numbers, but the ones here are hungry. Lemon Bay seems to be devoid of fish in the lights around the docks at night. Greenbacks, whitebait, sardines, cigar minnows are here and the guys catch them with sabiki, but we don’t see any pinfish around at all. The tarpon are around and guys are jumping them, but when the water got cooler and dirtier they moved away. rpon like 71-72 degrees. The BIG-4 SHARK Numerous species and sizes. Better hang on! Captain John Baines finding some early black fin offshore of Boca Grand during the middle of March.